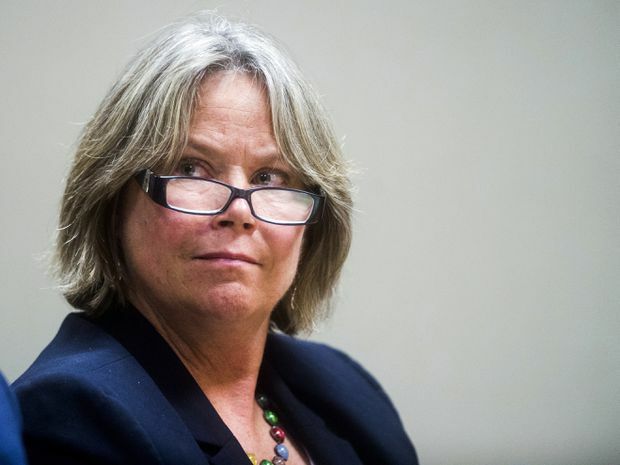 In a Monday, Aug. 6, 2018 file photo, Dr. Eden Wells listens to closing arguments from special prosecutor Todd Flood during the preliminary examination of Wells at Genesee County District Court in Flint, Mich.
Michigan’s chief medical executive will stand trial on involuntary manslaughter and other charges in a criminal investigation of the Flint water crisis, a judge ruled Friday. Dr. Eden Wells is among six people facing an involuntary manslaughter charge in connection to an outbreak of Legionnaires’ disease in the Flint area in 2014 and 2015. Dr. Wells is now the second high-ranking state official, along with Health and Human Services Director Nick Lyon, to be ordered to trial . Dr. Wells, a member of Governor Rick Snyder’s Cabinet, learned of the trial decision from Judge William Crawford II while inside a Flint courtroom. Dr. Wells has denied any wrongdoing, and her attorneys have said she had no legal duty to warn the public and worked diligently to investigate and resolve Flint’s water issues. Michigan Attorney General Bill Schuette charged Dr. Wells last year with obstruction of justice and lying to the police, and he later added the manslaughter charge. Mr. Schuette has said key officials, including Dr. Wells, knew about a spike in Legionnaires’ but waited too long to tell the public. At least 90 cases of Legionnaires’ occurred in Genesee County, including 12 deaths. More than half of the people had a common thread: They spent time at McLaren Hospital, which was on the Flint water system.